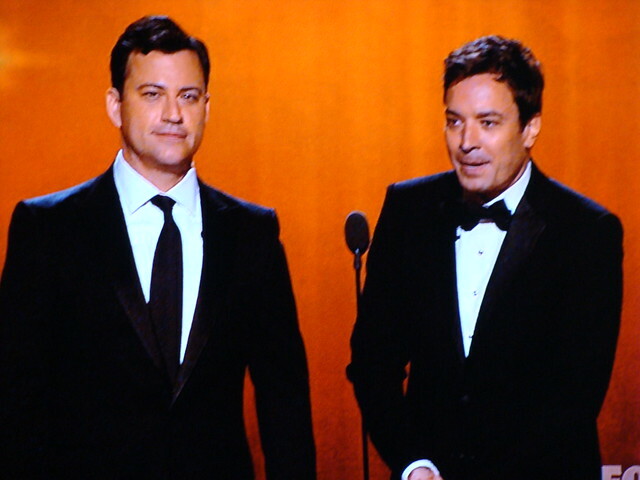 8:12 – Jimmy Fallon and Jimmy Kimmel are here to present Outstanding Supporting Actress in a Comedy. 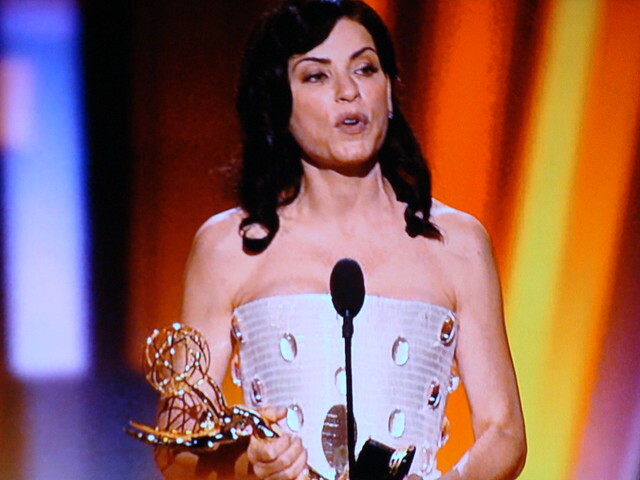 And the Emmy goes to… Madonna! What?? Oh, wait, it’s Julie Bowen. Sorry, the arms confused me. 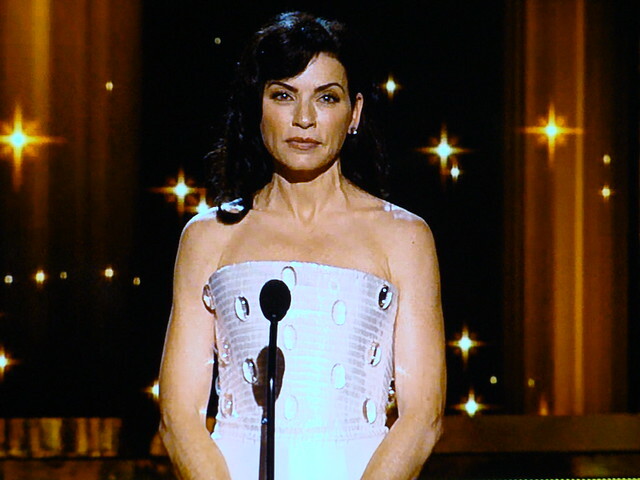 8:17 – Julianna Margulies is here having wrapped herself in one of those things you put in your bathtub so you don’t slip. She’s presenting Outstanding Supporting Actor in a Comedy. We both went with Ed O’Neill, I guess thinking the voters might try to make up for last year when he wasn’t even nominated. 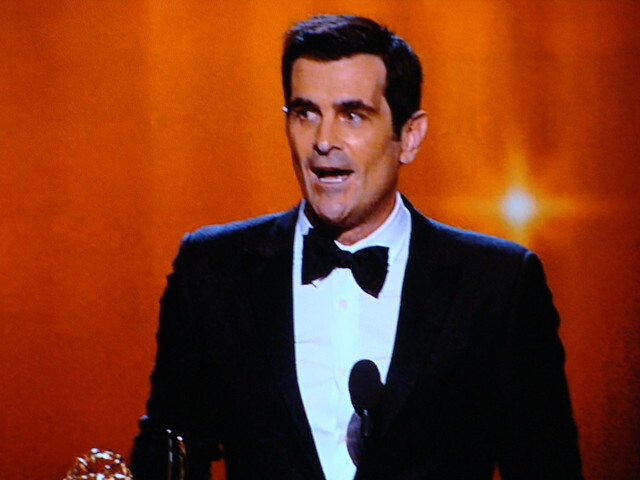 Ty Burrell wins instead. I’m cool with that, Ty Burrell is very funny and seems to also be a very nice guy. 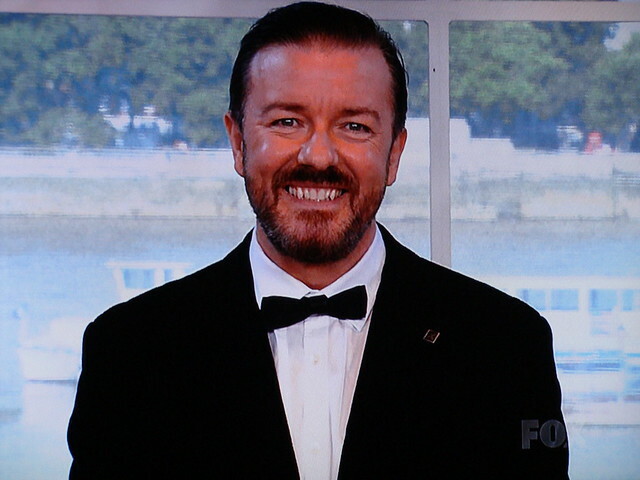 8:26 – Ricky Gervais is both continuing to pretend that he is some sort of Hollywood outcast and pseudo-presenting Outstanding Directing for a Comedy Series. We both went with 30 Rock since it was the live episode. 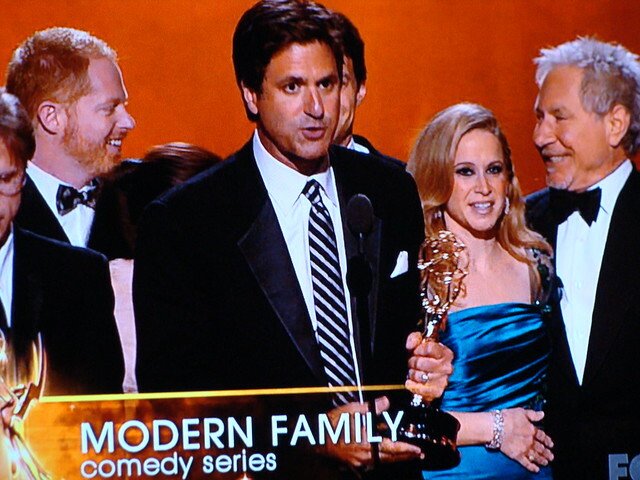 Modern Family wins instead. Wouldn’t it be funny if Johanna and I picked the same winner in every category AND managed to get them all wrong? It would make a complete farce of what is already pretty much a colossal waste of time! 8:30 – Will Arnett and Zooey Deschanel are here! Two people whom I love but maybe the shtick is wearing a bit thin finally? Anywayz, they’re presenting Outstanding Writing in a Comedy. Johanna and I both went with Modern Family. Finally, we got one right! The score is 1-1. 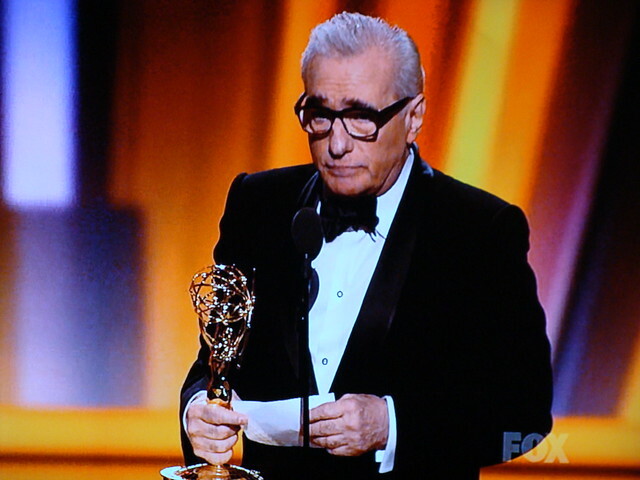 He’s presenting Outstanding Lead Actor in a Comedy. We both went with Steve Carell. Say what you want about the decline of The Office in general or the character of Michael Scott in particular, but Steve Carell had nothing to do with that. He was always terrific, even if the material he was given wasn’t. He deserves this one, guyz! But no, we would rather keep pretending that The Big Bang Theory is a much better show than it actually is (Full disclosure: I watch The Big Bang Theory). Jim Parsons wins. BOOOOO! 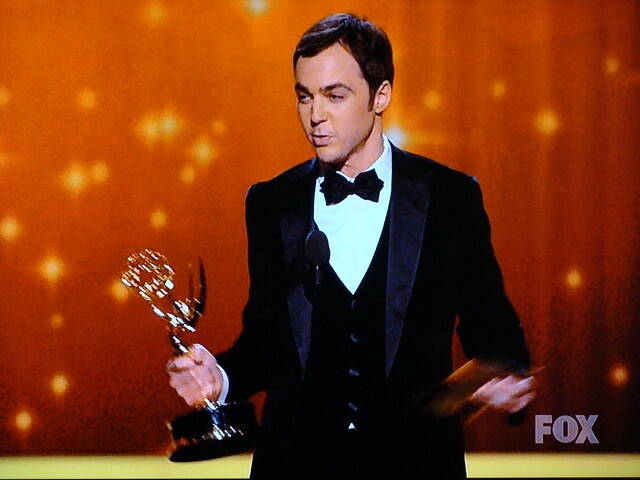 (Full disclosure: I like Jim Parsons). 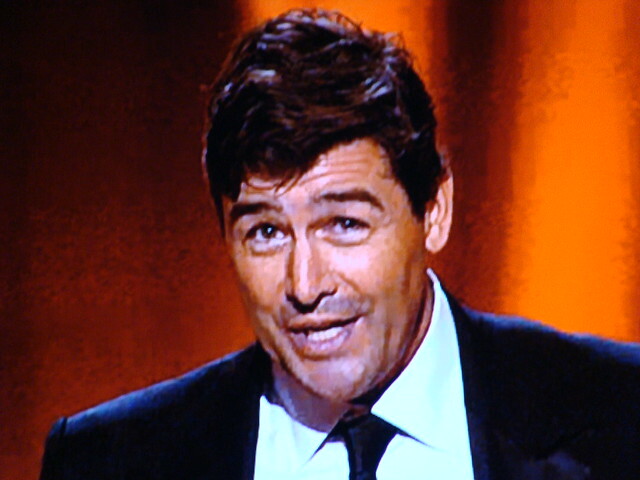 8:43 – Sofia Vergara and Rob Lowe are here to present Outstanding Lead Actress in a Comedy. I went with Amy Poehler because she’s totes adorbz and Johanna went with Edie Falco because those Showtime ladies always win. 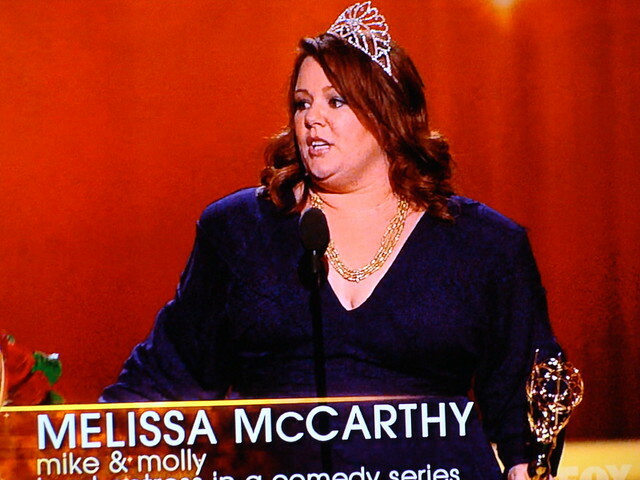 Melissa McCarthy wins instead? Seriously, from Mike & Molly? Spit take, amirite!?! If I hadn’t enjoyed her in Bridesmaids I would be totally fuming right now, you guys. 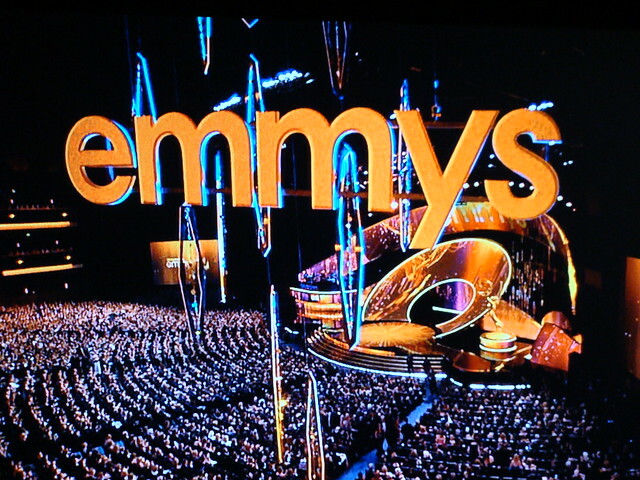 9:00 – Time for the montage to introduce the Reality/Variety categories! I love montages! I could watch short clips from television shows all night long! I am kind of an idiot! 9:01 – Kaley Cuoco and David Spade are here to present Outstanding Reality- Competition Program. Johanna went with Top Chef and I decided to not expend any energy thinking about this and just go with The Amazing Race. And The Amazing Race wins! Finally, one of us takes the lead: 2-1 me. Kaley and Dave are also presenting Outstanding Writing for a Variety, Music, or Comedy Series. We both went with The Colbert Report here because have you guys been watching that show lately?? He’s been on fire! Seriously, it has totally passed The Daily Show on my enjoyment meter. Whoever wins, we all win, because we get to watch the always hilarious clips that the shows provide. 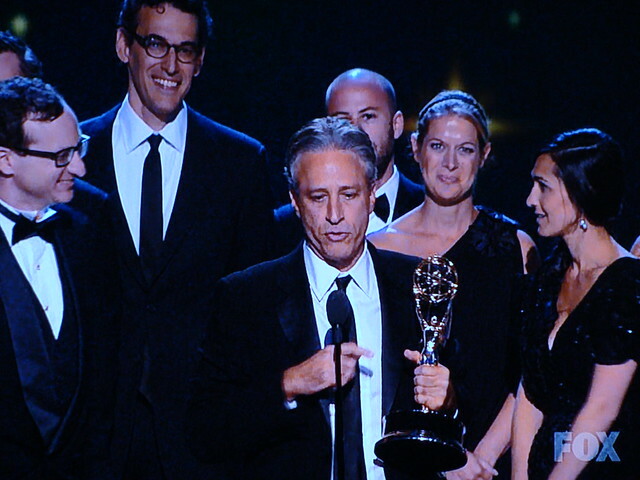 But, in actuality, only The Daily Show wins. Boring, but fine. 9:12 – Lonely Island is here with Michael Bolton. I’ve got to say, this has been a pretty enjoyable show thus far! The whole thing has been pretty funny and hip and in-touch, I think? Perhaps TV people are better than movie people. Take that, movie people! Take that all the way to the bank! 9:16 – The dead twin from Lost is here with movie star Sandra Bullock! Lea Michelle to present Outstanding Directing for a Variety, Music, or Comedy Series. I stuck with my guns and went with The Colbert Report. Unforunately for all of us, Johanna pulls into a tie by picking the winner, Saturday Night Live. I should have seen that coming; I don’t know how much actual “directing” is going on on The Colbert Report. 2-2. 9:18 – Scott Caan and Anna Paquin are here to present Outstanding Variety, Music, or Comedy Series. I, again, perhaps a bit unwisely, went with The Colbert Report. Johanna went with the winner, The Daily Show. Yikes! She leads, 3-2. 9:26 – Yay! Drama montage! 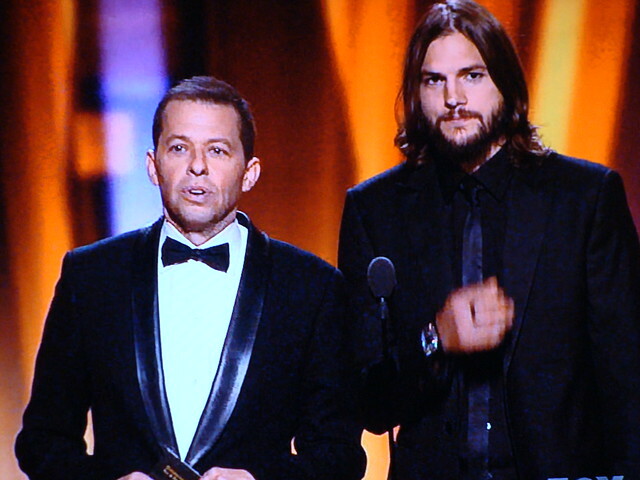 9:28 – Jon Cryer and Ashton Kutcher are here, which means we’ve now had three of the two and a half men! They’re presenting Outstanding Writing for a Drama. We both went with Mad Men’s episode “The Suitcase” because for serious that episode was tha realness. 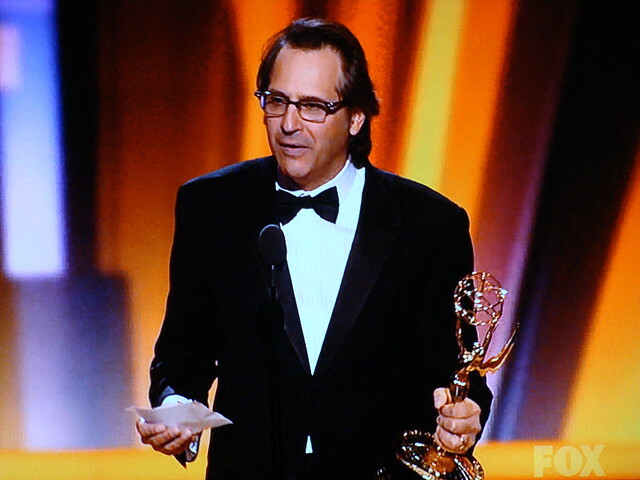 Jason Katim wins for Friday Night Lights. A bit of a surprise, but no complaints in this household! As I said earlier, clear eyes, full hearts, can’t lose! 9:40 – Here are some people I don’t really know. 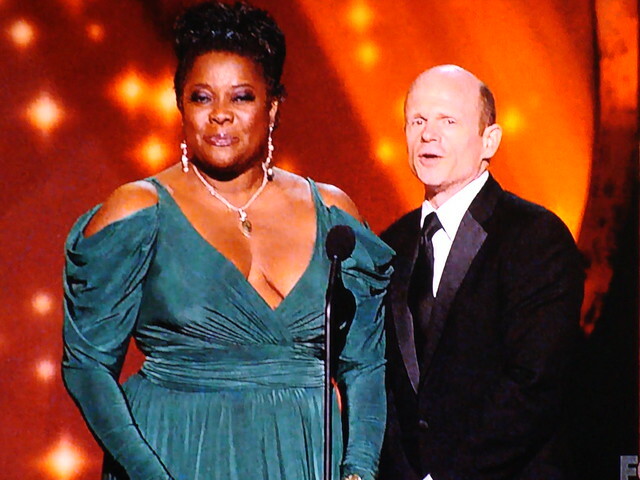 Loretta Divine, I think, and is that the guy from ER? Oh, well. They’re presenting Outstanding Directing for a Drama. We both went with Boardwalk Empire because Martin Scorsese, obvz. He wins, obvz. 4-3, Johanna. 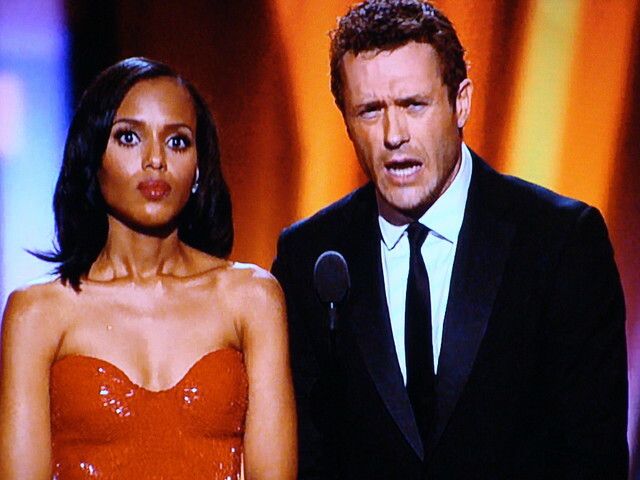 9:43 – Now, Kerry Washington I’ve heard of, but who is this guy? Jason O’Mara? I’m going to guess he’s on…Burn Notice, maybe? 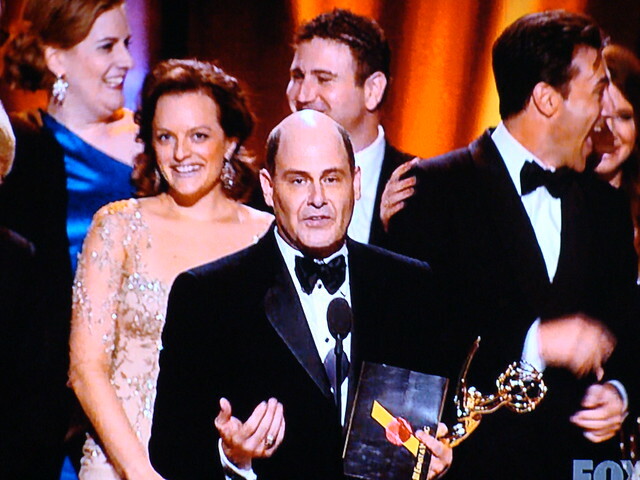 They’re presenting Outstanding Supporting Actor in a Drama. We both went with John Slattery here, although I must admit that I did make a few unfortunate jokes about Peter Dinklage having podium trouble. 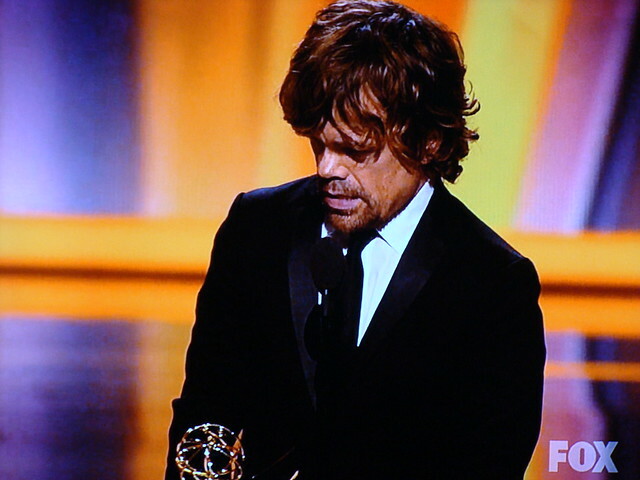 And Dinklage wins! Thankfully, no podium. 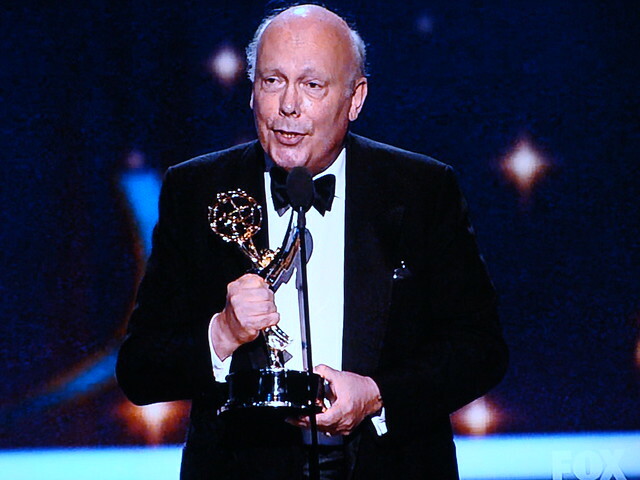 Nice to see him and Game of Thrones get some love. Johanna says “I like his little suit.” When I ask her if she’s comfortable with me putting that in the blog, she responds, “It was well-tailored!” Seriously, though, let’s move on. I’m not this person who makes these jokes. That’s not me, I swear. Who are you to judge? You don’t even know me! Stop judging me! 9:53 – Bryan Cranston and Katie Holmes are here. 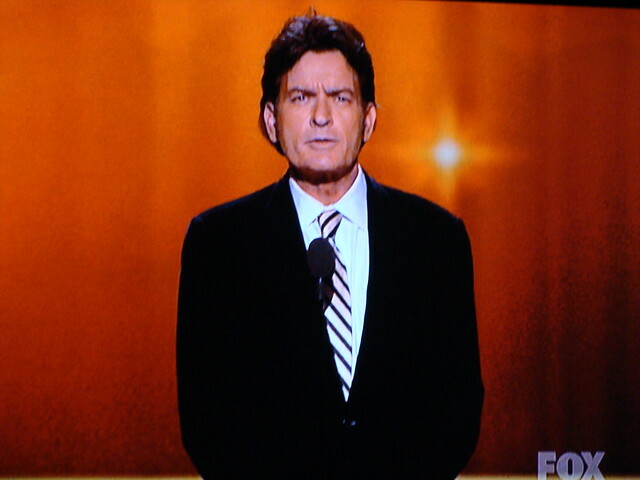 It’s funny to see him with hair after watching so much Breaking Bad. Did you guys see him in Contagion with all that hair all over his head? Weird! I went with Julianna Margulies because I heard that supposedly somewhere people both watch and really love The Good Wife. I have no idea what it is, personally. Johanna went with Connie Britton because, you know, she’s Tami Taylor! Of the Texas Coach Taylors? Margulies wins. The score is 4-4. 9:57 – Drew Barrymore, fire your agent. You should never have agreed to stand next to these ladies on national television. They’re presenting Outstanding Lead Actor in a Drama. 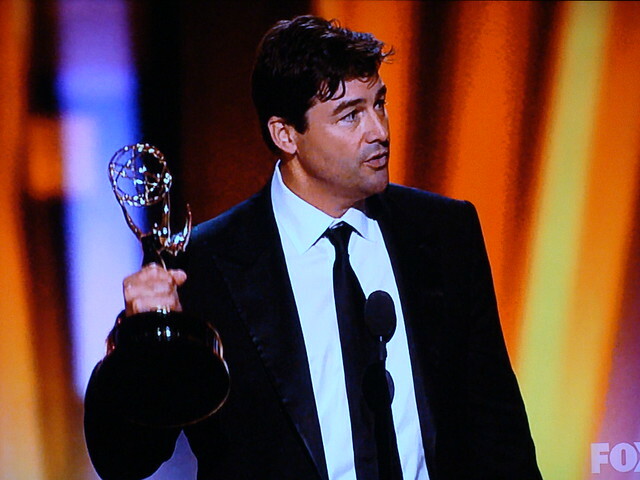 We both went with Jon Hamm, but shock awe Kyle Chandler wins! Friday Night Lights WHATTTTT! I’m sort of conflicted here, though, because I love both Hamm and Chandler and was really hoping Hamm would win this year since Bryan Cranston wasn’t on the ballot. 10:08 – Haha, everyone hates these guys! They’re presenting Outstanding Writing for a Miniseries or Movie. Both of us went with Downton Abbey, but only one of us finished watching it. I’ll let you decide which one of us that was. It wins; we’re at 5-5. 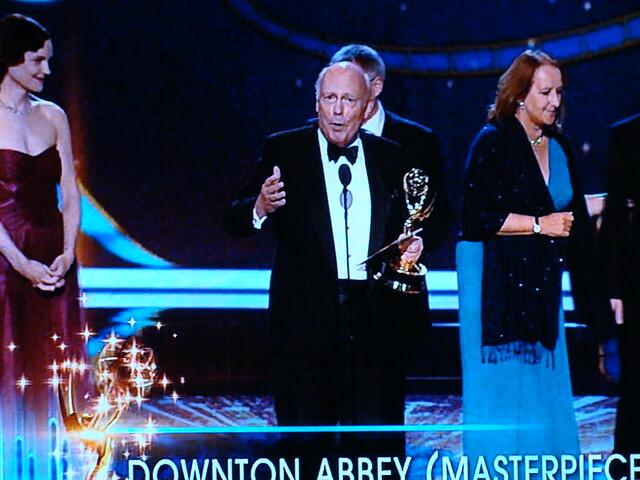 Obviously this guy wrote Downton Abbey. His son’s name is (get this) Peregrin. 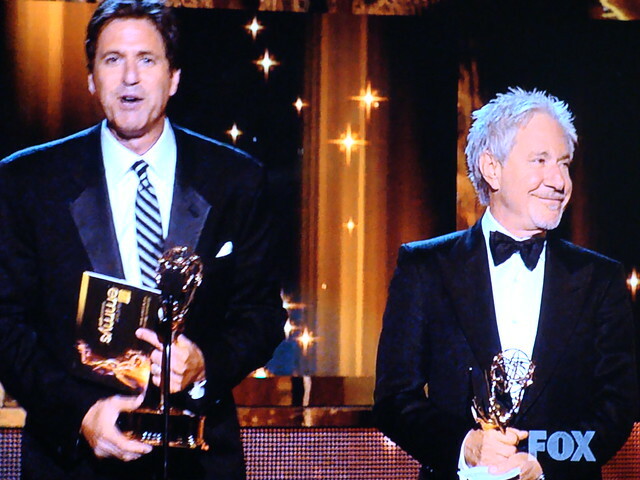 The boyzzz from Entourage are also presenting Outstanding Supporting Actress in a Miniseries or Movie. We both went with Maggie Smith from Downton Abbey, and she wins. 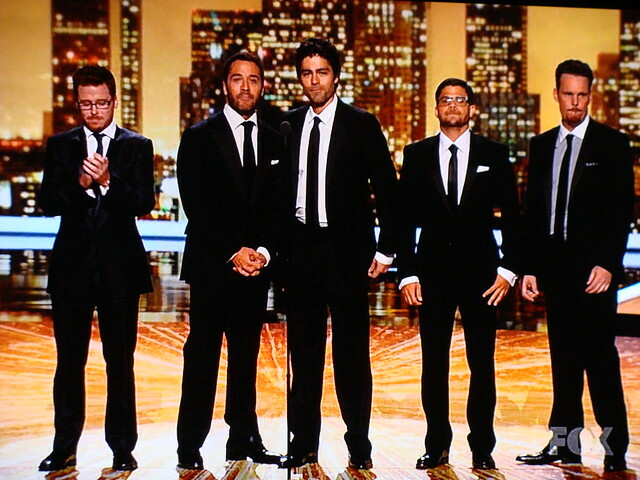 Maggie Smith is not able to be here tonight, so the cast of Entourage accepts her award on her behalf. A million monkeys typing for a million years could never have spit out that sentence. 6-6. 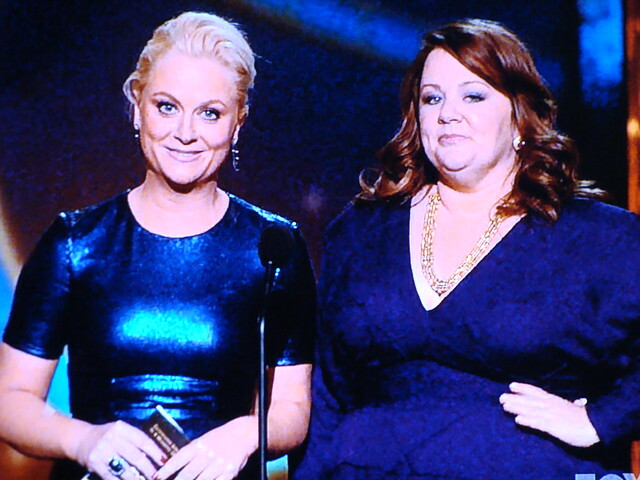 10:18 – Seeing Melissa McCarthy and Amy Poehler together all night keeps making me think that Amy was in Bridesmaids. Amy Poehler totally should have been in Bridesmaids. They’re presenting Outstanding Lead Actor in a Miniseries or Movie. Johanna went with Carlos from Carlos. I went with Larry Fishburne from Thurgood. That’s right, I called you “Larry,” Larry! I know you hate it, but I don’t care! Barry Pepper wins instead, which I’m fine with even though I’m quite sure that The Kennedys is a steaming pile of rotten garbage, because Barry Pepper is awesome. I have never seen Barry Pepper in something and not thought he was awesome. 10:22 – And now it’s time for this guy. 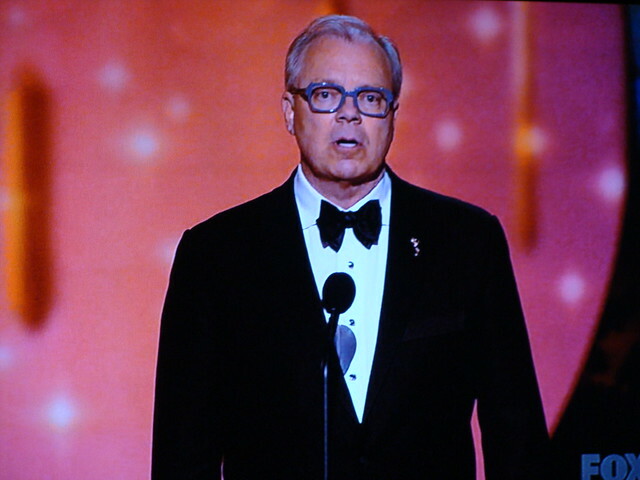 I am immediately bored, thinking this is just some academy spiel, but no WAIT OH IT’S THE IN MEMORIAM MONTAGE! 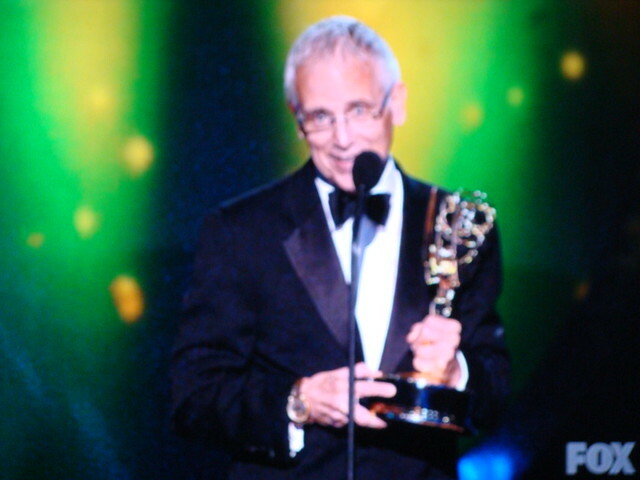 YOU GUYS KNOW HOW MUCH I LOVE THE IN MEMORIAM MONTAGE! IT’S THE BEST MONTAGE! Who are these guys singing? Is this NKOTB? Is this Ari’s daughter’s opera group from the series finale of Entourage? We should all definitely keep covering “Hallelujah” for sure. We definitely, totally have not done this enough yet. 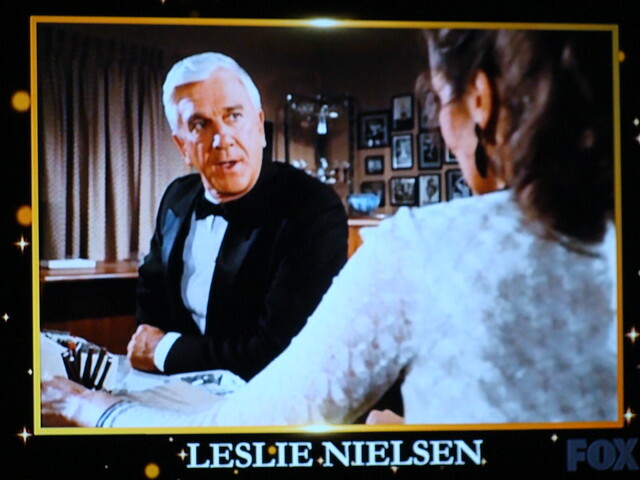 People are constantly taking to the streets clamoring for more covers of “Hallelujah.” Also, Leslie Nielsen. 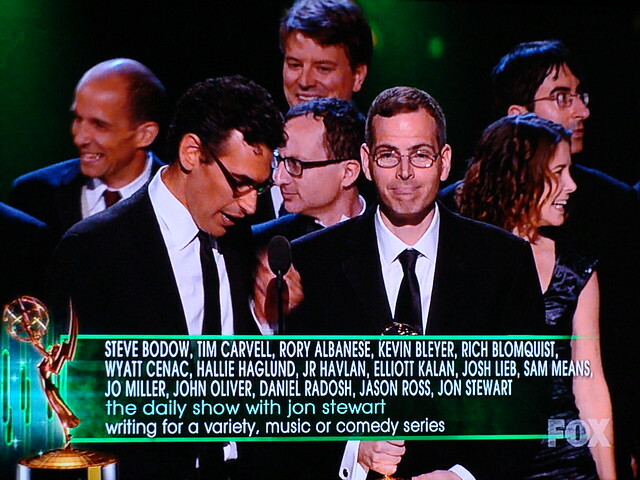 10:32 – Anna Torv, David Boreanaz, and David Boreanaz’ weird haircut are here to present Outstanding Supporting Actor. Johanna and I split the Too Big to Fail vote. She went with Paul Giamatti and I went with James Woods. 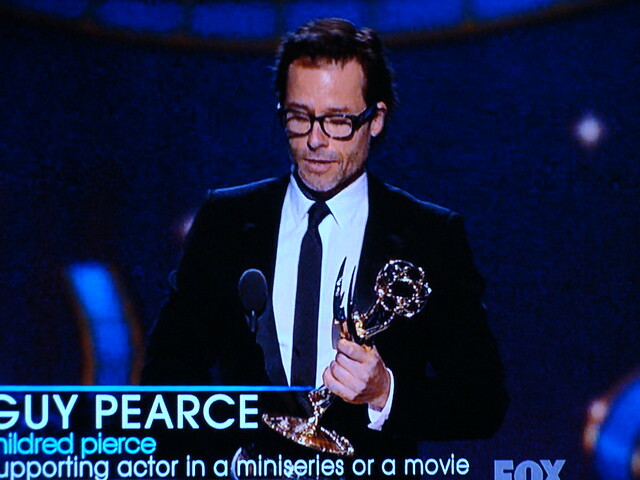 Meanwhile, Guy Pearce wins. 10:36 – Hugh Laurie and Claire Danes are here to present Outstanding Lead Actress in a Miniseries or Movie. We both went with Kate Winslet because MOVIE STARRRRRRR! She wins. 7-7. Are we going to tie? We’re going to tie, aren’t we? 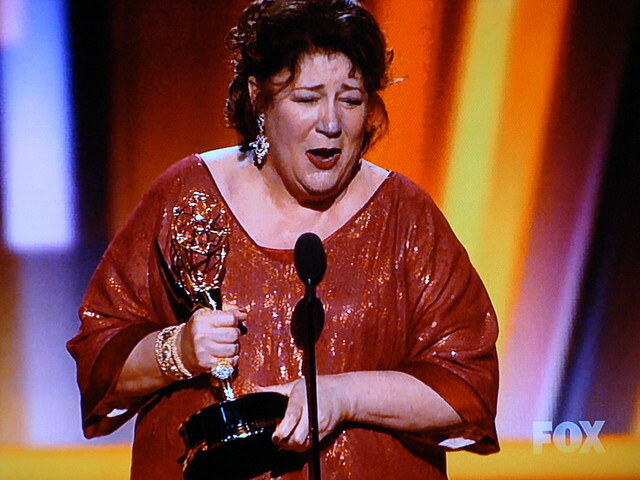 “She’s a bit too much of a movie star to be this excited about an Emmy,” says Johanna. 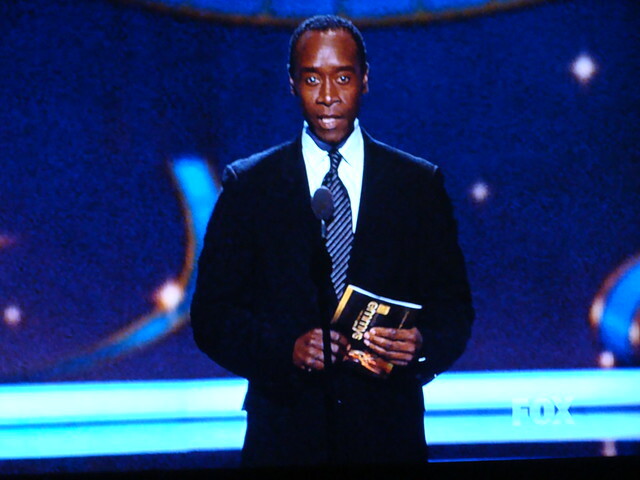 10:44 – Don Cheadle is here to present Outstanding Miniseries or Movie. Want to hear something funny? I’m pretty sure Ocean’s Eleven is the first thing I saw Don Cheadle in, and I actually thought he was British. And his British accent is terrible in that, right? That’s how stupid I am. We both went with Mildred Pierce, but Downton Abbey wins instead. Upset! 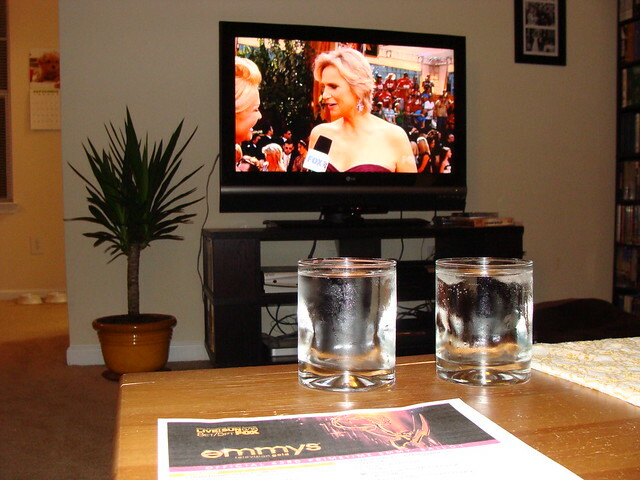 10:47 – Maria Bello and Tall Peter Dinklage William H. Macy are here to present Outstanding Drama Series. I’m really surprised that they’re saving comedy for last. We both went with Mad Men, because come on have you seen Mad Men? It wins, thank god. 8-8. We’re totally going to tie. 10:55 – Gwyneth Paltrow, huh? This is like the Contagion awards! Speaking of Contagion, if you haven’t seen it yet, SPOILER ALERT: Bryan Cranston like, TOTALLY has hair covering the entire top of his head! We both went with Modern Family, and it wins. Yup, we tied. 9-9. Snooze! Well, they wrapped that up before the Modern Family people could even get off the stage. A nice tight three hours. I’ll take their lead and say good night. Good night, everybody! Good night, Moon! Good night, Jane! 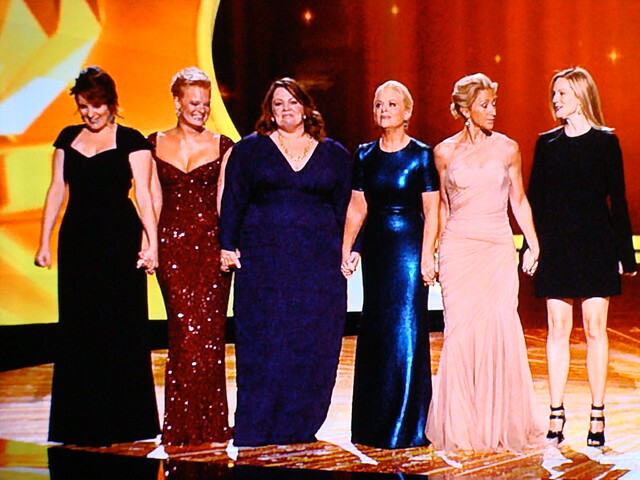 I was actually rooting for Steve Carell, Amy Poehler/Tina Fey, Jane Krakowski, and Parks and Rec/30 Rock to win. It’s just sad that none of them won. But at least I got to see that amazing thing they did where all the lead actress nominees in comedy went up on stage and the audience gave them a standing ovation. 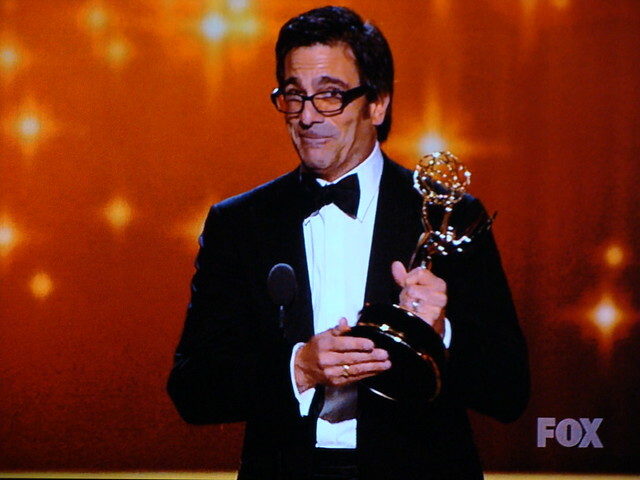 Best part of the Emmys for me. I would have loved to see Parks and Rec win an Emmy or two. 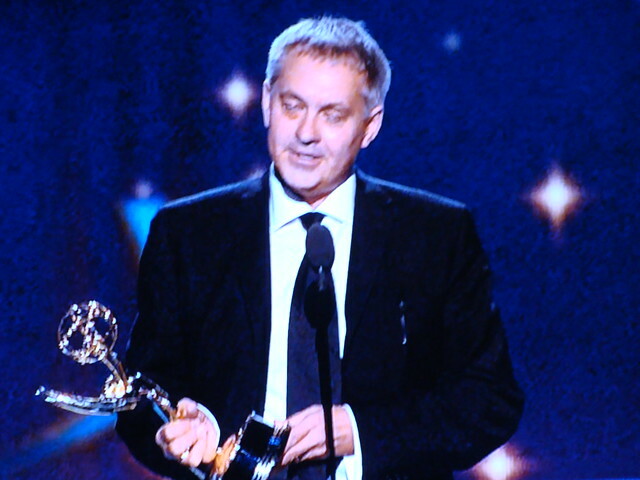 Best comedy on television.